Introduction: In this article i am going to share How to show only current month's dates in calendar control or we can say how to remove or hide other previous, next month's date in calendar control in asp.net using both C# and VB languages. 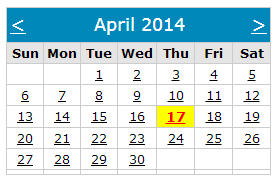 Remove or hide next previous month's date in calendar control in asp.net. How to highlight current date i.e. today's date in calendar. How to make calendar control look attractive by setting its attributes. By default asp.net calendar control display some dates of previous and next month as shown in side image. Notice that default April month calendar is showing 30 and 31 of previous march month and 1 to 10 of next may month. But we want to show only current month's date in calendar which is very easy. I have shared how to do this in this article. Implementation: Let's create a simple web page to demonstrate the concept.
" I hope you have got How to hide or remove other month's date in Asp.Net Calendar control and If you like my work; you can appreciate by leaving your comments, hitting Facebook like button, following on Google+, Twitter, Linked in and Pinterest, stumbling my posts on stumble upon and subscribing for receiving free updates directly to your inbox . Stay tuned and stay connected for more technical updates."